I pride myself in keeping my blog personal to my experiences and to reviews of things I have tried and come to love. I try not to report on a brand new product or company that is out unless I’ve tried it myself to give you my honest opinion on it. So, in having adapted this philosophy, it doesn’t surprise me when big news slips through my radar, but I am finding that news worth reporting somehow brings itself right into my face, such as with star stylist Ted Gibson! During Inauguration Pre-ceremonies I had the pleasure to do makeup for Amy Brenneman, the beautiful actress from the show Private Practice. I came a bit early, chit chatted with her amazingly talented husband about how things have been in D.C. thus far while setting up and waiting for Amy to arrive. A few minutes later Amy came in with a hairstylist followed by two videographers. I figured she was going to be doing an interview of some sorts while getting ready. It turns out the two men were actually following the hairstylist, who introduced himself to me as Ted Gibson. The two men had been collecting footage of the events he was doing including an earlier shoot he had with Ted and Caroline Kennedy for Vanity Fair. When first meeting Ted I instantly loved how polite and sweet he was and how easy it was to work with him. He completely worked around me and what I needed even after I was insisted that he be comfortable and in good spot for him to work in. It was such a nice experience that I didn’t even mind the two video cameras taping me do makeup while he was doing hair. 🙂 I truly had no ideal what a big star he was until his story started to unfold about his salon in NY and the new one he just opened in DC. 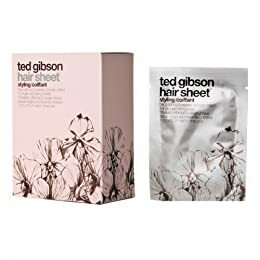 When I asked him about the beautiful pink and brown boxed product in front of him he proceeded to take out a few “Styling Hair Sheets” wrapped in a shiny silver foil, embedded design, and his name on the front. He told me I could get his line at Target now and gave me some hair towelettes to try out in the future. Upon talking more about what they did and how I could use them for my own fine hair he then decided that his “Building Spray” would work great for me followed by a blowdry and/or hot rollers and gave me a bottle of it to take home with me. He held himself in such a great manor and complimented everyone throughout the time we were there. It’s no wonder celebrities and his client’s alike fall in love with him even before seeing the final result of the guaranteed gorgeous style! Ted proceeded to give Amy an elegant hairstyle with a slightly off centered part with hair that swooped down both sides before cascading curls began to fall. He told me he had just opened his new salon in the Washington D.C. metro area called Ted Gibson Salon & Hela Spa. It has already been visited by great celebrity names on the first day, like Anne Hathaway and Tatiana Ali. He also told me how it sat atop of a Louis Vuitton store at The Collection in Chevy Chase, MD., only minutes away from downtown D.C. How much more fabulous can you get? You can also find his complete haircare line at Target stores nationwide: Ted Gibson at Target as well as other select products at Sephora.